It is likely that by the end of the month, the average temperature will rise and 2013 may not end up being the coldest – but it should be in the bottom five and possibly the bottom two. Have no Fear! NOAA and GISS will proclaim it the warmest on record, beating out last years “Adjusted” final! However they may well go for a Photo Finish! All those Florida retirees from Chicago, must be dropping like flies! Only temporary – they will be back to vote again in November 2016. But snow is also just weather — i.e. variation on the more stable climate (i.e. average). Heavy snow begins to affect road and air travel as the Met Office issues yellow “be aware” warnings. Scotland and the north of England are expected to see up to 20cm (eight inches) of snow build up from today into Wednesday morning, with temperatures dropping as low as minus 15C (5F) overnight. 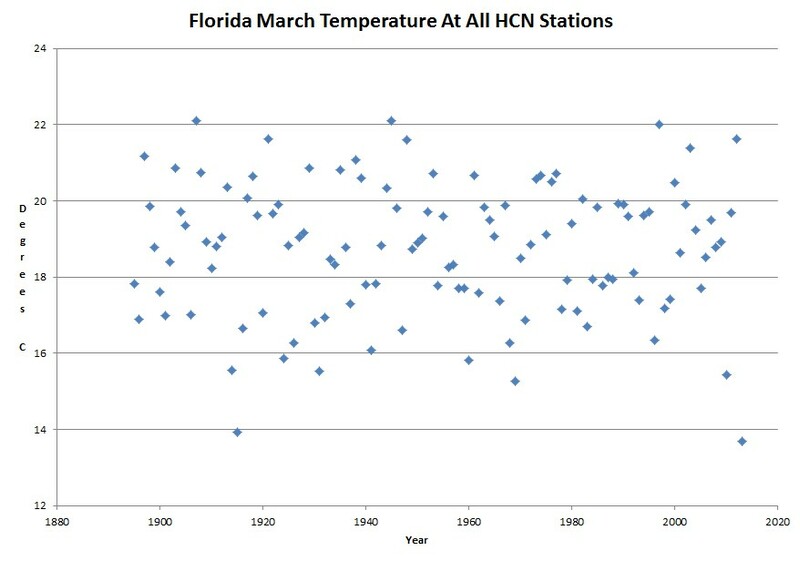 I live near Tampa, and can confirm that March temperatures have been well below normal (as in 20 F below the normal morning low). Take a look at HADCET too. Not looking good for another scorching year in England. Nearly a quarter of the year done and an anomaly of about -0.7°C so far. Warmest March on record in 2012, coldest March on record in 2013. Is the climate changing? Of course it is. Sooner or later, the deniers will come to their senses, maybe even Rush Limbaugh! What was not “moderate” about my comment?